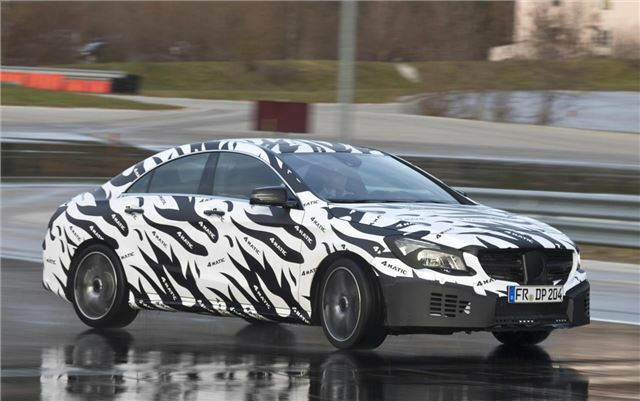 The new CLA-Class saloon from Mercedes-Benz will be available with an all-wheel drive system when it goes on sale in the UK in late 2013. The CLA-Class is to sit between the A-Class - on which it is based - and the C-Class in the Mercedes-Benz range with prices expected to start at around £25,000. The disguised picture above hides a car based on the Concept Style Coupe first shown at the 2012 China Auto Show, which is pictured below. It's designed to be a smaller more stylish equivalent to the standard C-Class and similar in style to the Mercedes-Benz CLS. It will share a lot of components with the recently launched A-Class. It’s set to feature the same level of safety equipment as the A-Class, including an advanced collision prevention system that will assist with braking if an imminent crash is detected. This will be complemented by the addition of the new 4MATIC all-wheel drive system. Under typical conditions the car will be front-wheel drive, but when more traction is needed, such as in snow, the rear wheels will receive drive from the engine via a seven-speed dual-clutch transmission. The system has also been designed to stabilise the car if it starts to skid or spin, offering an extra level of safety before the traction control or ABS step in. The 4MATIC will be installed in the CLA43 AMG model as well as other CLA-Class variants. The high-performance variant of the CLA43 AMG will feature a 2.0-litre petrol engine with more than 400Nm of torque.